What inspired you to write Godless Americana? 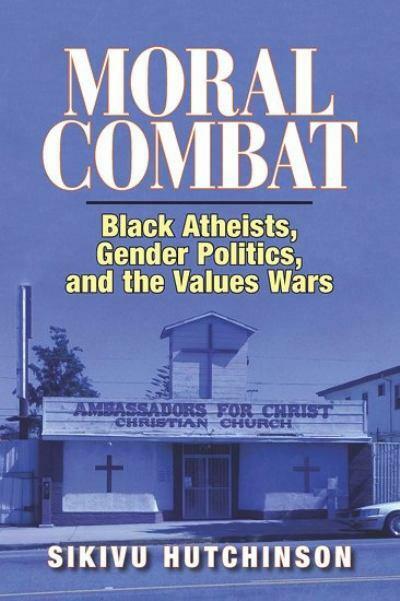 After writing Moral Combat in 2011 I became increasingly outraged by the extreme rightward turn of public policy and national discourse. I felt that there needed to be a strong atheist/humanist rebuke and critique of the strident xenophobic nationalism and racist propaganda that erupted with greater vengeance during the 2012 presidential campaign. I wanted to make a statement against this climate and outline a radical humanist alternative. In addition, there has been much fanfare about the rise of the so-called “Nones” (or those who have rejected organized religion). However there is no evidence that people of color—especially women of color—are rejecting organized religion, much less God, in any significant numbers. I wanted to explore the reason for this, while at the same time providing a radical voice for the growing numbers of openly identified non-believers of color. That humanism can be culturally relevant to communities of color. Traditional mainstream white-dominated freethought/atheist/humanist models don’t offer an adequate basis for social justice. They don’t address the intersection of women’s rights, civil rights, anti-racism, heterosexism, the racial wealth gap, and educational apartheid. In the book I push back against the myth of the accessible American dream and look at the devastating impact that the recession has had on communities of color. I ask how one creates a just society based on the principles of anti-racist godlessness; rejecting supernatural, faith-based explanations for the universe, morality, ethics and human accountability. I emphasize the need to build on the historic connection between non-belief and movements for human rights liberation. In the early-to-mid 20th century, many non-believers and freethinkers of color, as well as radical whites, were deeply invested in the struggle for civil rights, women’s rights, gay rights, the labor movement and anti-imperialist resistance. They were not primarily academic or intellectual elites (á la atheist superstars like Richard Dawkins, Sam Harris and Christopher Hitchens) and came from all walks of life. Moreover, they understood that reaching across the ideological aisle to organize with progressive believers was a necessity if they were going to gain any traction in their local communities (the examples of A. Philip Randolph, James Forman and the Black Panthers are illustrative in this regard). So while there are numerous grassroots atheist groups spearheading their own projects, the movement as a whole continues to be publicly defined by a handful of superstars and their limited vision. The absence of historical and sociological context for atheist politics, and its disconnection from social justice activism, will keep it in the lily-white one-percent column. I have no patience for single-issue white male atheists who inveigh against the backwardness of organized religion as the fount of all evil and then have the luxury to retreat into their segregated ivory towers, insulated conferences, and highly-paid seminar bubbles. In Godless Americana I address the lived experiences of some of the most religious communities on the planet in one of the richest nations on the planet. I probe the sociological context for faith traditions and hyper-religiosity in American communities of color. One bedrock issue is the way students of color are disproportionately denied access to college prep courses, suspended, placed in special education and pipelined into prisons instead of being given a decent shot at a science and humanities-based education. These are not conditions that confront white families and white children—atheist, evangelical, working class, middle class or otherwise. Brilliant white youth who want to be oncologists—unlike my 12th grade mentee Karly Jeter, who identifies as Christian—are not told that they come from a dysfunctional culture that only excels at sports and making babies. And they are not excluded from gatekeeping Advanced Placement science courses because their counselors didn’t believe they were capable or the classes weren’t offered on their campuses. Because of the pervasiveness of 21st century-style mass incarceration many youth of color will not be able to get jobs or housing. They will not be able to vote or pursue a college education. For this generation, the promise of upward mobility and the American dream is a sham. Progressive community-based religious organizations grasp the complexities of this reality. The best ones actively seek to redress it. And that is where the gap between the so-called New Atheism and radical or culturally relevant humanism lies. More discussion about abortion and reproductive justice vis-à-vis all of the draconian legislation that’s come down from states like Kansas, North Dakota, Texas and Mississippi. The fact that abortion and birth control policies continue to be hijacked by the extreme right is an atrocity, as is the destructive whitewash of the devastating impact of climate change. I believe that legal abortion and universal access to contraception are human rights—period. Women of color have the most to lose from the increasing crackdown on and medievalist rhetoric about abortion. One of the biggest is that non-believers are a one-trick pony, singularly obsessed with church/state separation and battling creationists. Again, the number of atheists of color has grown, but the atheist movement as a whole has not embraced the issues that people of color struggle with on a daily basis. For example, the wealth gap between blacks and whites is more pronounced now than during the Brown vs. Board era. When I drive around in my community I see scores of abandoned businesses, boarded up buildings, vacant lots, three-ring strip malls (hair-liquor-check cashing) and churches, churches and more churches. Travel a few miles to the west to predominantly white communities, even the so-called working class ones, and it’s a radically different story. In the book I highlight how de facto segregation has become more intractable now—such that, according to the US2010 project, upper middle class African American and Latino homeowners actually live in poorer neighborhoods than do low-income white people. That cold reality belies bromides about post-racialism, colorblindness and meritocracy. And it also underscores why faith-based institutions remain so powerful in black and brown communities. Fellow non-believers and progressive believers were my specific audience, but I was also interested in addressing folk who have become galvanized by deepening disparities in K-12 education, public sector employment, health care and homeownership. Hopefully all of the above. Sacred cows are liberally skewered. The cover is a picture of a white angel headstone in the Inglewood Cemetery in South Los Angeles, circa when the area was a predominantly white enclave and home to a Streamline Moderne-style theater that was supposed to be the original site of the Academy Awards. Post white-flight in the sixties and seventies Inglewood became a predominantly African American community. It now “boasts” an eclectic array of faith institutions from Church of Scientology storefronts to mosques. I think the cover evokes many of the book’s themes about whiteness, innocence and redemption; bringing it full circle to the last chapter which explores the racial politics of death and the so-called moral abyss of non-belief. One recent book I’ve read that I really admire is Harriet Washington’s exhaustively researched Medical Apartheid. Washington nails how legacies of scientific racism and white supremacist medical experimentation inform contemporary perspectives on the black body. A novel based on the 1978 Jonestown massacre (from the perspective of two black women protagonists) and an anthology entitled Women of Color Beyond Faith.